German stocks look set to open on a cautious note Friday as traders patiently await a crucial meeting of US and Chinese leaders at the G20 summit. Trade tensions may worsen if the efforts fail to achieve positive results. The German equities index finished slightly lower yesterday after prosecutors raided the headquarters of Deutsche Bank in a money laundering investigation, while most other European bourses ended higher helped by the latest stress test results on UK banks and dovish comments from Federal Reserve Chairman Jerome Powell. Earlier this morning, German retail sales for October were released, however no impact on the Dax as of yet. Otherwise, it's a light day for Germany today on the economical events front. All eyes are on the meeting between US and Chinese leaders at the G20 summit. Unable to break the key resistance level yet again at 11415, the Dax edged lower yesterday but found buyers at the 11265 support level and therefore remained stuck within tight trading range for the 3rd day in a row. However, a bearish engulfing candle was formed and looking ahead, the index might move lower today as selling accelerates should prices move below the 11265 level where further sell stops could get activated. 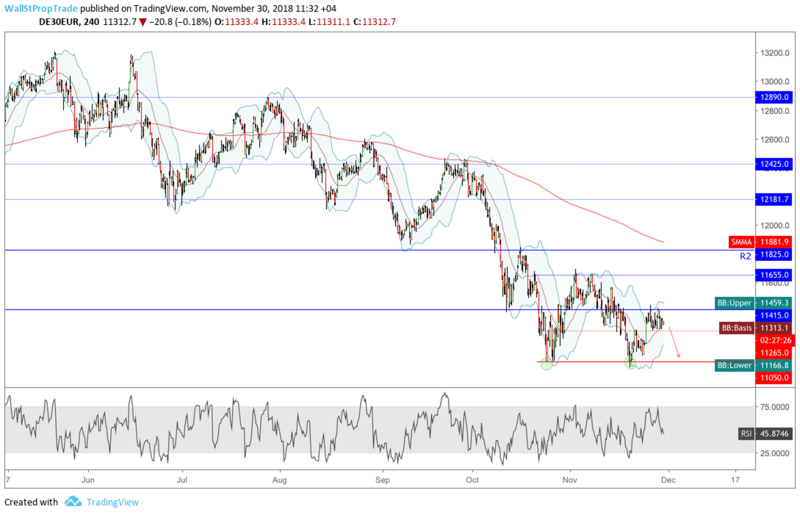 The RSI looks bearish on the short-term suggesting some downside action ahead.